Every Sabbath, more than a thousand people gather to worship with the Walla Walla University Church community (and often more than double this number). Whether in person on the campus of Walla Walla University, online via Facebook or wwuchurch.com, or delayed via Blue Mountain TV or Loma Linda Broadcasting, WWUC worship services provide weekly touchpoints for people to connect with the Creator, learn more about Him, and be inspired to continue following Him in a world that is full of challenges and darkness. Worshipers joining the WWUC community are blessed by world-class musicians, remarkable spoken word, and also a host of typically unseen leaders working behind the scenes to pull it all together. One team of key leaders are known by the technical teams and pastors as "floor managers." These dedicated volunteers make quick decisions on Sabbath mornings, keep an eye for the details, coordinate communication amongst many teams, and act as hosts to guest musicians and speakers. Don Veverka, one of the WWUC floor managers, says about his role, "Finding meaningful ministry space within our community can be tough given the whirlwind of our daily lives. Serving as a floor manager for the University Church the last five years has been both a blessing and a privilege. I encourage others in our community to join the team and share in the joy of this supportive ministry." Nicole Reedy, the University Church's office manager, has served as a floor manager during the past several years. She adds, "It’s fun to be a part of the behind-the-scenes team that cares so much about the small details that help us enjoy a smooth and meaningful worship experience." Sophia (Rich) Fullerton reflects on her experience as well, "Being a floor manager is a great way to get to know members of the congregation you wouldn’t otherwise talk to. During my time as floor manager, I developed a greater appreciation for those who lead off the platform to run the lighting, sound, and cameras during the services. Having been a member of this church since childhood, I often struggled to see a way I could contribute to the ministry of such a large church family. Floor managing, in addition to music, was a way I could support our church’s ministry first hand." Whether you are a student or a long-time member of the University church, if you are interested in becoming a floor manager or lending your hand to one of the other technical teams, please contact Pastor Kris Loewen: kris.loewen@wallawalla.edu or 509.527.2826. 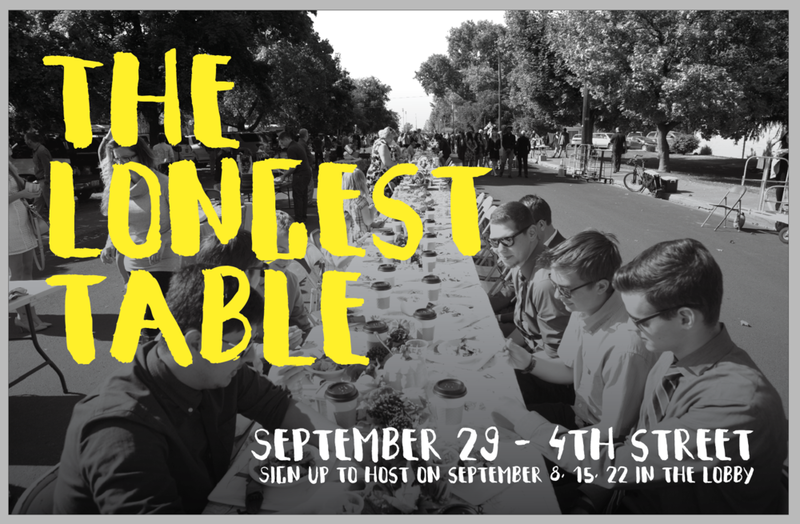 You are invited to the tenth annual The Longest Table, hosted by the University Church, on Sabbath, September 29. This well-loved event features more than 1,000 feet of table stretching down 4th Street from College Avenue all the way to SW Davis Avenue. University Church members have signed up to host tables and are eager to meet new friends. After church, students and guests are invited to find a seat at the table, get to know your hosts, and enjoy the amazing experience that is The Longest Table. The meal will begin with prayer shortly after Second Service concludes, approximately 1:30pm. If you have not had a chance to sign up to HOST a table, there are some tables left. Stop by and see Nicole in the lobby today or email church@wallawalla.edu to reserve your table! Contact Pastor Alareece Collie with questions: alareece.collie@wallawalla.edu. We wish a warm Walla Walla welcome to all students, both returning and new. How wonderful it is for the campus to again feel alive with young people. Welcome! It is also a great privilege to introduce Cristian Neacsu, the new chair of the department of music, and his wife Qian Yin. Prior to their six years at Burman University in Canada, both Cristian and Qian received DMAs in violin performance from University of Illinois at Urbana-Champaign. Cristian is a native of Romania and Qian of China. Please join me in welcoming them to our church and community, and please join me in thanking them for sharing their music with us. The anthem presents an arrangement of the familiar hymn Near to the Heart of God (No. 495). I invite you to meditate on this text as you prepare your heart to worship God. I offer this hymn especially to students newly arrived on campus; it speaks to those in need of “quiet rest” or “comfort sweet” or “full release.” Whatever your need, I know you can find the answer near to the heart of God. Thank you for your generosity to the ministry of the University Church. The mission of our community of faith is to teach people, young and old, how to follow Jesus. We do this through sacrificial investment in K–12 Christian education, excellence and beauty in worship services which are broadcast around the world, and outstanding generational ministries led by incredibly dedicated staff and volunteers. Your gifts to the University Church budget make this world-changing work possible! To donate to the University Church budget, mark your tithe envelope or give online via the website. Navigate to wwuchurch.com and click "Give." You will be taken to the "Adventist Giving" portal where after logging in, you can set up a structured, recurrent, automatic giving plan. This site, like the web-bulletin, is mobile friendly! The church office will have new regular hours: Monday–Thursday 8am–1pm and 2pm–5pm; Friday 8am–12pm. Sign up to host tables at The Longest Table. The event is Sabbath, September 29 following Second Service. Anyone may sign up to host tables. Signups in the church lobby beginning at 9am on September 22. Contact Pastor Alareece with any questions: alareece.collie@wallawalla.edu. WWU CommUnity for the 2018-19 school year begins on Tuesday, September 25, at 11am in the Sanctuary. John McVay will speak. University Church members are welcome to attend this gathering or any during the year. We are sad to share that KarrLayn Beck passed away at her home on September 15. A Celebration of Life service will be held on October 6 at 4pm in the University Church Sanctuary. Church members who would like to help support the Beck family may sign up to provide a meal for them at takethemameal.com. Search "Beck Family" with the password "0312" to find information and dates that meals have been requested. Contact Lori Ann Wilkinson with questions: 509.540.0586. Charles Edwards passed away early September 7. There will be a viewing on September 22, 12pm-5pm and September 23, 10am-3pm at the Colonial-Dewitt Funeral Home, Dalles Military Road. A Celebration of Life will occur on November 3, at 3:15pm in the University Church Sanctuary. Elizabeth Jane “Betty” Beck, mother of Brandon Beck, passed away at her place of residence in College Place on Sunday, September 9. Plans for a memorial to be held in San Antonio, Texas, are pending. A memorial for Victor A. Merth will be held Sabbath, September 29, 2018, at 4pm in the Village Church Chapel. The Christian Aid Center invites you to an open house for their new Center for Women and Children on Sunday, September 23 from 2pm-5pm. There will be tours, ice-cream sundaes, and activities for kids. A ceremony will be held at 3pm. Attendees are invited to bring donations of food, diapers, toilet paper, and paper towels to help stock the pantry. We will be welcoming returning Walla Walla University students on Sunday, September 23 at the residence halls with cookies. If you enjoy baking and would like to be a part of this special welcome please email renee@wallawalla.edu or call 509.527.2772. Rogers' Jog-a-thon is Friday, September 28. Students will run continuously for an hour at Martin Field Track to raise money for classroom technology upgrades. Contact a student you know to make a flat donation or a "per lap" donation. You may also contact the Rogers' school office to find out other ways to help: 509.529.1850. The North American Division #EndItNow campaign will host a free online summit on Tuesday, September 25. The summit will teach participants about abuse and how to help in a dangerous situation. For more information and to register visit: enditnownorthamerica.org. The Red Cross will host a blood drive at the University Church on Friday, September 28, 10am-3pm. If you are able to give blood, please consider taking some time to participate! Your gift is incredibly valuable, especially in the wake of Hurricane Florence. The Red Cross reports that platelet availability is of particular importance at this time. Show up in person at any time or pre-register at: redcrossblood.org. The College Place Spanish Church is having an “Enchiladas To Go” fundraiser for Christian Education. To place an order, call 509.525.9523 or 509.301.2956 or email enchiladasforeducation@gmail.com before October 9. University Church are invited to join us. Please RSVP to the Village Church office, 525-0882. Training for Youth Leadership is October 12-13 at Columbia Adventist Academy in Battle Ground, Wash. This Youth Sabbath School Leadership Training by the North American Division and the North Pacific Union is for adults and youth who lead, or will soon lead, Youth Sabbath School. Learn how to start, restart, revive your youth Sabbath School in your church. Register at https://ignitesstraining2018.eventbrite.com. Need Training in Communicating? Attend One Voice: Communicating With Excellence on September 30 from 10am-4pm at the Upper Columbia Conference Office. Pastors, church, and school communication leaders are invited to this one-day seminar geared to help you communicate with clarity and excellence in an age when getting your message across is increasingly challenging. $15 covers lunch and seminar materials. Register online at http://www.uccsda.org/communications or contact the communications department at 509.242.0512. A women's retreat is planned October 26–28. Upper Columbia Conference invites you to Camp MiVoden for “Beautiful,” a weekend for teen girls and women to be refreshed at Hayden Lake. The keynote speaker is Cindy Tutsch, a seasoned speaker who has shared the gospel around the world in over 60 countries. Register online at: uccsda.org/WomenRetreat2018 or by calling Wendy (afternoons only) at 509.838.2761. Hispanic couples retreat is September 28–30 at the Red Lion Hotel near the Pasco Airport. The main speakers will be Claudio and Pamela Consuegra. To register or receive more information, contact Walter Pintos at: WalterP@uccsda.org or by phone: 509.242.0535. 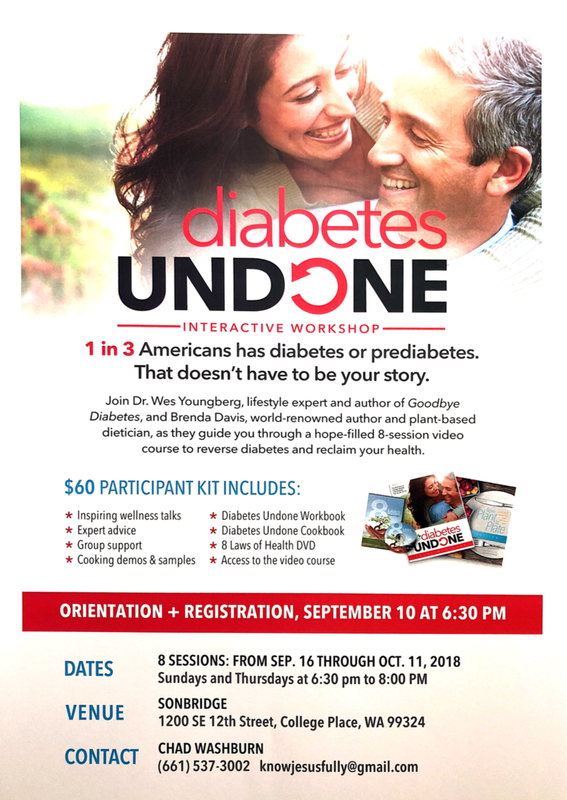 Diabetes Undone seminar is planned in September at SonBridge. Registration on September 10 at 6:30pm and 8 weekly sessions follow beginning September 16. $60. Contact Chad Washburn for details. knowjesusfully@gmail.com.